Dubai, UAE, October 16, 2018: We’re only a few days away from November and Thanksgiving will be here before you know it! Whether you like to celebrate the season of gratitude with your family and friends or simply enjoy having a turkey dinner around this time of year, Tub of Butter has got you covered with a month full of activities including turkey and pie baking masterclasses, a deliciously prepared turkey dinner to go and corporate offerings too. If you love to cook and wish to hone your culinary skills, then why not sign up for one of Tub of Butters’ Thanksgiving Cooking Masterclasses with the talented in-house chefs . You can learn to roast the perfect turkey or make a fabulous pie just in time for the holiday season. Alternatively, if you’re pressed for time and want to enjoy Thanksgiving in the comfort of your own home, but without all the hassle of cooking, leave the turkey and trimmings to the team at Tub of Butter. You can simply pre-order your turkey dinner from starter to dessert 48 hours in advance and pick it up on the day and claim it as your own. We won’t tell anyone if you won’t ! Not to mention, you’ll also be able to shop the gourmet marketplace which is lavishly stocked with special Thanksgiving retail items including themed cookies, candied apples and cinnamon muffins. 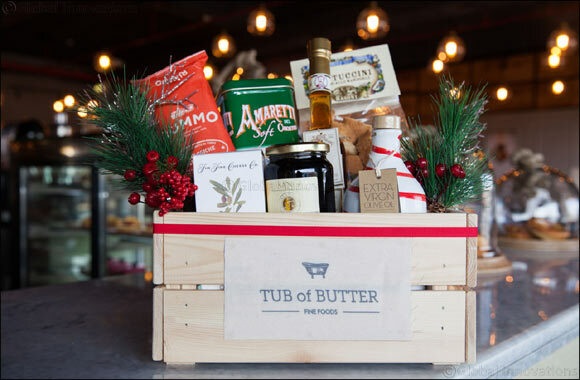 Tub of Butter can also help arrange a corporate or team Thanksgiving dinner. Book in for Tub of Butter’s set menu to enjoy with your colleagues on or around Thanksgiving day. *Fillings can be Pecan, Cherry, Apple, Rhubarb, etc.